Things you need to remember for ALL types of re-rooting. • Make sure you keep the hair about 1/2 longer than you want the final length to be. You do need to cut to style the hair, so better to have it longer than too short! • You need patience, rooting a doll can take several hrs to several days depending on the size of doll and the complexity of the rooting pattern. • hair for the doll either saran(nylon) or natural fiber. Some people use actual human hair, or you can use longer MOHAIR. You can get either a weft of hair (saran or mohair) which has the hair all sewn together or a Skein of saran, or a package of mohair locks. 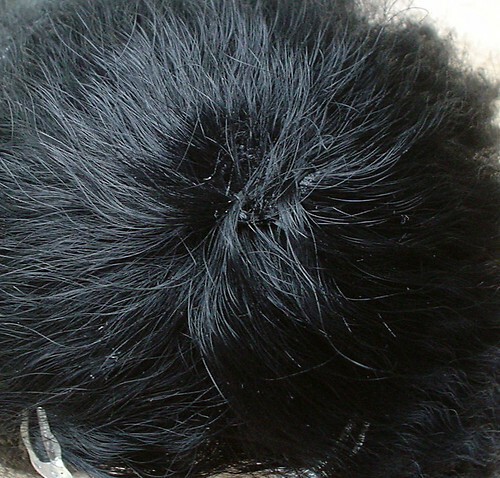 Ebay also often has an abundance of wefts both mohair & saran. You can also look at your local beauty salons, or places where people have “tracks” or extensions put in. a track of hair is basically a weft. This is the link to my flickr account with images for re-rooting.I will be adding more as soon as I find my good camera!!! I had done more, but my camera has gone missing with the images on it, so here’s a few I took this afternoon. 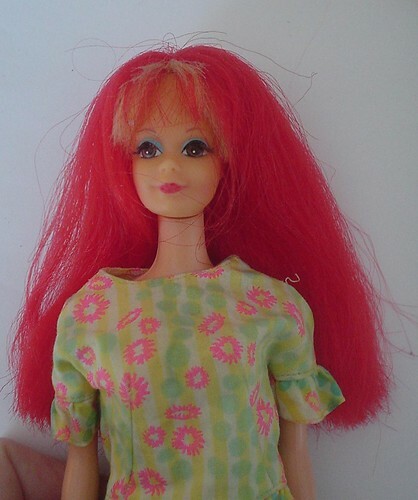 Cheap dollar store dolls usually have heads that will just pop off like the vintage Barbie dolls. Now you need to scalp all her/his hair off. Using scissors cut the hair as short as you can, then take a pair of nail clippers (sharp ones work best) and snip the hair down to the scalp. 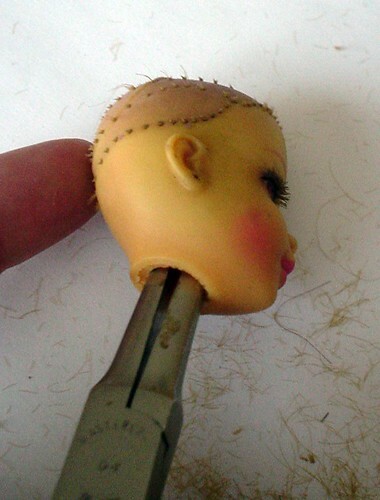 The curved shape of the nail clippers seems to conform to the doll head so that you get a really close cut. Now take either needle nose pliers or a crochet hook… or both and swirl and pull the hair out from the neck hole. Reaching into the head from the neck-hole pull out as much hair as you can, this should give you a pretty clean scalp/head to work with. At this point you may want to paint the scalp the colour of the hair you are re-rooting with, or you may want to leave it be. IF you are painting the skull you SHOLD prime it with plastic primer so that it doesn’t crack and chip while you’re working on the hair. There will be SOME cracking and chipping regardless. Following the old pattern is usually the best idea, BUT if you want to change the style, or your doll head had no original hair there are a few choices you can make. The hair usually spirals down from the crown in rows. 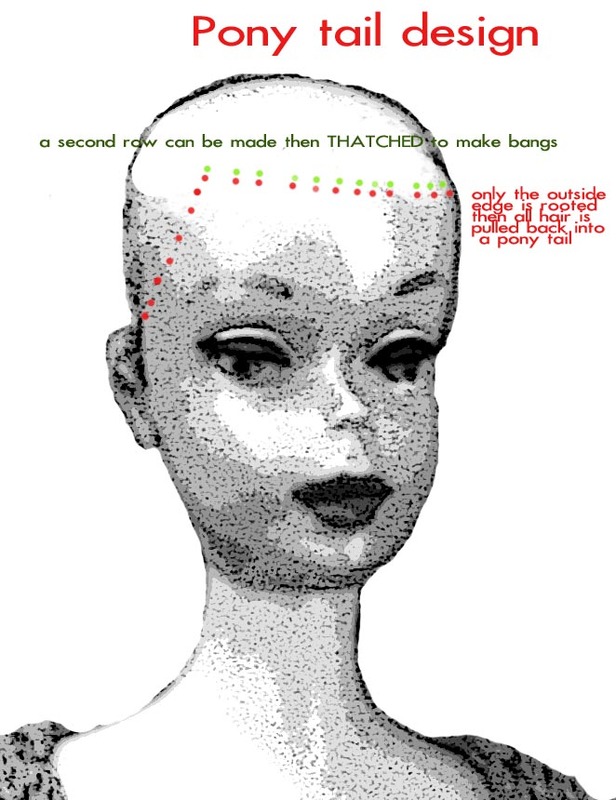 But if you want a fast thinner style you can simply re-root around the outside of the hair line and pull it back into the center in a pony tail , a lot of cheaper dolls have this style, and it can be quite effective especially if you paint the scalp. If you want to make a part in the hair make a double row of holes in a line in the direction you want the part to go, you will re-root this then THATCH the part. 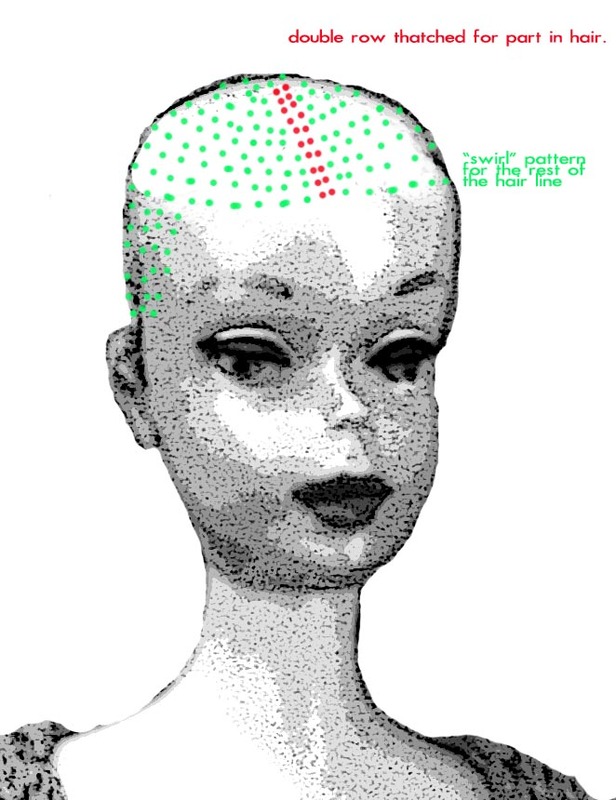 Re-root the rest of the head in the normal spiral pattern. Thatching can be fiddly; you re-root each hole in your preferred method and then weave the hair from side to side, making a nice part in the hair. If you’re OCD this is the part you might like best! You need a special tool or maybe not so Special. 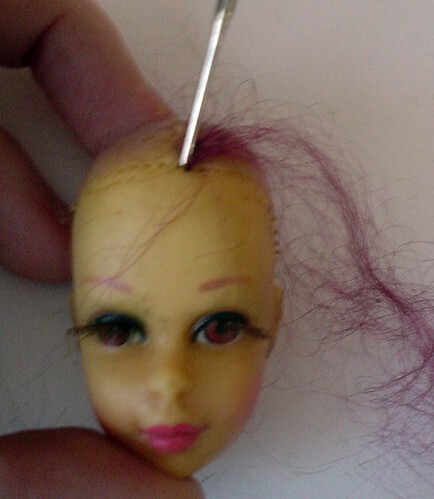 A Felting Needle is used to push or “punch” the hair fibers into the holes in the scalp of a doll who has previously had rooted hair, OR into holes you have made using a hot needle BEFORE you start your re-root. 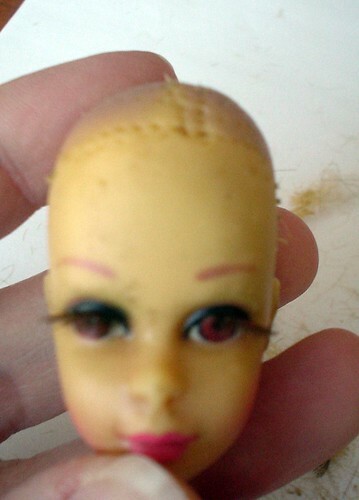 I usually try and use dolls that I have cleaned the original hair out of, it makes following the pattern easier. However if you need to make holes in the head you can make them with a heated darning needle. Heat your needle with a candle so that it gets hot. REMEMEBR TO USE CAUTION! You will need to clean your needle because the carbon will leave streaks in your scalp. Personally I try and avoid this step. 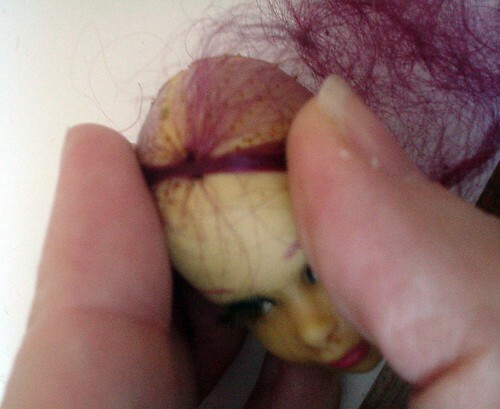 IF I need to add hair to a doll that has NO HOLES I try and use a “WEFT” of hair. But If it’s quite a small doll this is not always practical. I will come back to “WEFTING” a doll later. 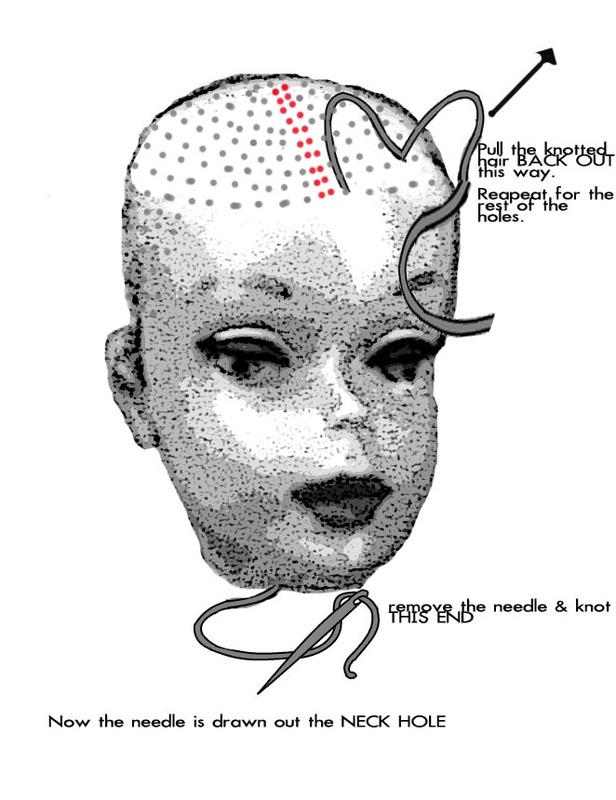 The barbs on the felting needle will cause the hairs to tangle inside the doll’s head creating a “knot” that holds it in place. 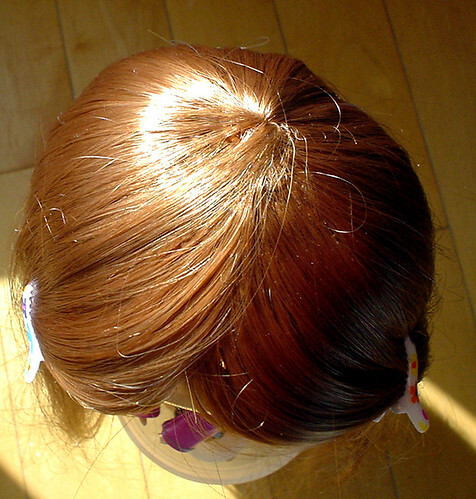 This is a fairly permanent method of re-rooting dolls hair, although and brushing or pulling of the hair will make some of it fall out. Push a few strands of hair into the hole (either one you’ve made or one of the cleaned out holes) head using the blunt end of a broken felting needle or some other blunt needle, then I push a good felting needle into the hole and push up and down a few times to knot the hair fibres, then push some more hair into the hole with the blunt needle, and repeat the process. You continue doing this same process until each hole in the doll’s head is filled. 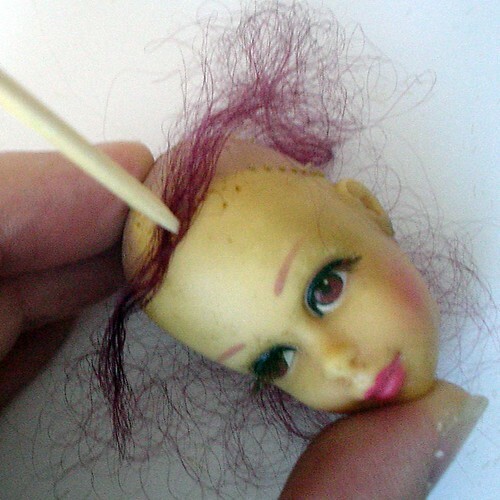 This is a good method for ART dolls that will not be handled very much. 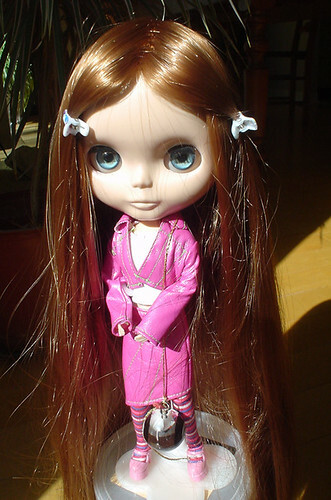 It is not suggested for any doll that will be played with or that has extensive styling to be done with their hair. YOU WILL LOOSE HAIRS. You can also punch root into soft materials like wax. I haven’t. Making a wefted re-root is not super hard, just a little persnickety and time consuming. 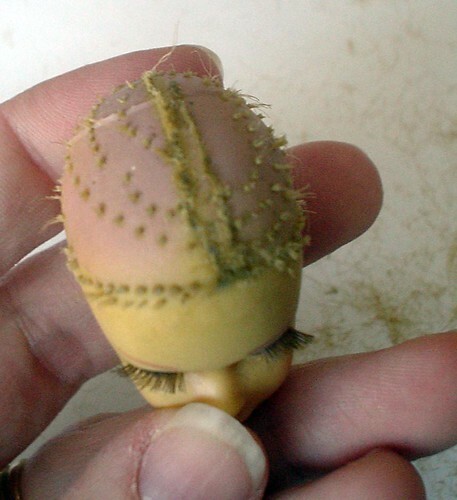 It’s a good solution to a doll don’t that has no holes. You can just use your sewing needle to make the holes, a longer needle is better, but basically anything will work. 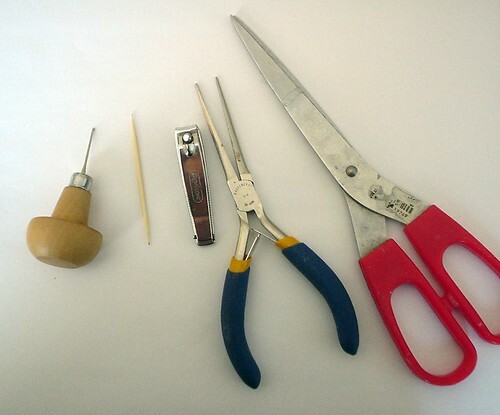 You could also need a thimble just to save your fingers if the needle is being stubborn to push through. Basically you sew the weft straight on to the scalp moving in a circle the same way rooted hair is done. 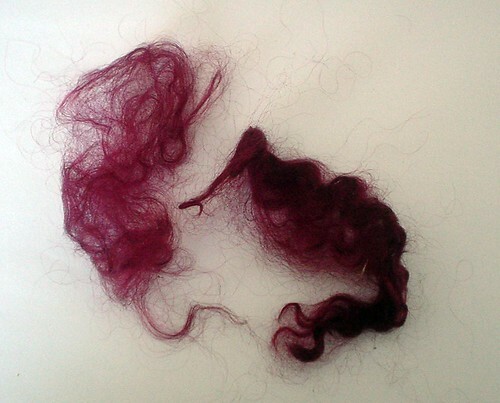 I use invisible thread, but you can use any thread preferably the same colour as the weft. It’s better if your scalp is the same colour as the wefted hair, but if you make sure to keep the wefted part close together it doesn’t matter that much. If my wefts look like there is a big gap between the rows I will simply loop the thread under the last row and pull the two rows together. You do not need to sew into every hole (if you’re using a scalp that has had its hair removed and still has the holes.) but like any sewing you want to keep your stitches small. So you keep going around until the top is almost completely filled. 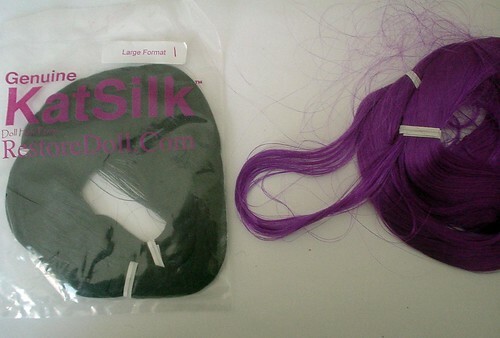 You will need about 2-3 wefts for a larger doll. This also depends on the amount (or length) you are getting in each weft. When starting or changing wefts I fold the first bit under so that it doesn’t have any of the thread from the weft hanging out. Keep enough space at the top to make a small slit in the scalp with a utility or exacto knife, BE CAREFUL not to cut your self! Take a small piece of the weft which is not sewn to the head, and roll it into a tube, sew the bottom of the tube closed (where the sewn weft is) and push that through the slit you have made. If its wavy just style it and bush it down over the rest of the hair, this covers up the top wefted bit quite well. If it’s straight, you need to brush it the way you would like it to cover then use a wet towel and a hot iron to fix the hair in the style or position you want, DO NOT KEEP THE HOT IRON ON TOO LONG or you will MELT the hair! ALWAYS KEEP THE TOWEL DAMP WHEN IRONING THE HAIR INTO PLACE! This is a pretty sturdy type of re-root. 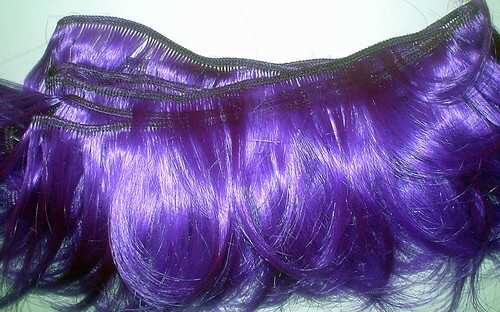 If you are using synthetic hair you will be able to brush it, although you always need to be gentle with dolls hair. It not only comes loose it can easily break, and unlike us it doesn’t grow back! Thread a larger darning needle with about 20 strands of doll hair. I usually end up threading the needle and having to fold about ¼ or the way down. 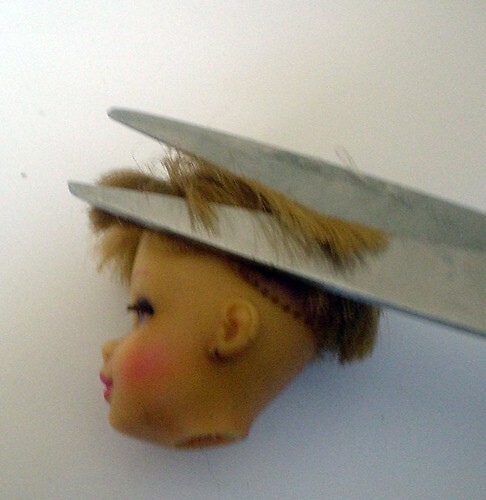 Carefully push the needle from the outside of the top of the scalp and pull it out of the neck hole. Next take the hair plug out of the eye of the needle. Tie a knot on the end of the hair you have pulled through the neck hole and pull the hair plug from the other end until you feel tension. 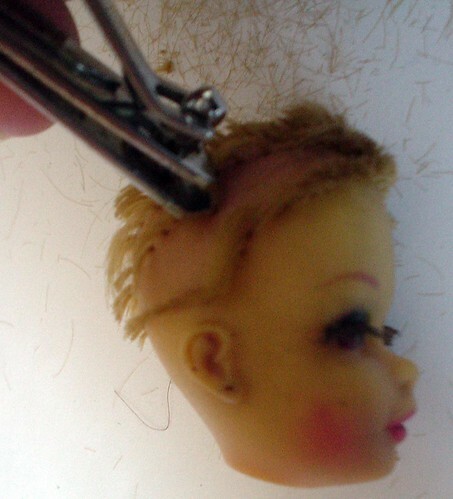 Cut the hair plug at about 1/2″. You want to make sure that your knot/plug is not too bulky in the head. I’ve used this on Barbie and kiddles and other fashion dolls. It does allow you to work with smaller amounts of hair. The Knot method is also very good for rooting eyelashes. The procedure is the same, but you need a smaller needle and do only one or two threads/strands at a time. If all else fails you can always buy the hair and glue it into place! Reminder – EBSQ LIVE Tonight! Please join us tonight at 9PM EST (6PM Pacific) in the EBSQ Chat Room for Noelle Hunt’s presentation on how to re-root doll hair. 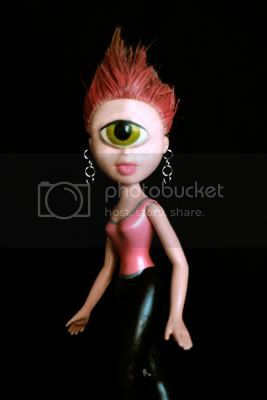 Her altered dolls are unique and creative and her presentation are always interesting and informative. All the information on this presentation, can be found on the Education page. To get there at any time, please click the “Learn” tab at the top of any page on the main EBSQ site. If you have any other questions, please feel free to drop a line to edu@ebsqart.com. 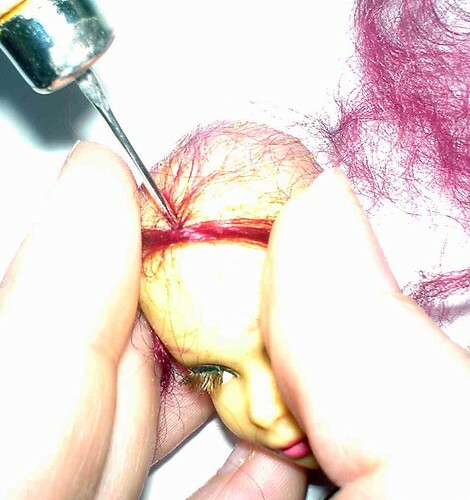 Giving your doll a whole new head of hair can not only save a vintage doll your trying to restore, but can also give an art doll a whole new look! It takes some time and patience but can be incredibly rewarding! Or look your time-zone up. February’s EBSQ LIVE will not be on it’s usual second Monday of the month. This month LIVE will be on the third Monday, February 16th. The time will still be the same so please join us at 9PM EST(6PM Pacific) in the EBSQ Chat Room for Noelle Hunt’s presentation on how to re-root doll hair. Her altered dolls are unique and creative and this will be an interesting presentation even if you don’t work with dolls. If you do work with dolls or are thinking about doing so, February’s LIVE will be indispensable. For all the information on this presentation, please click the “Learn” tab at the top of any page on the main EBSQ site. Every month this page will feature the current month’s EBSQ LIVE presentation. It has the what, the who, the where and the when – including how to find “the when” in whatever time zone you find yourself in. With all this information, be sure to put checking whats coming up in EBSQ LIVE on your monthly to do list. 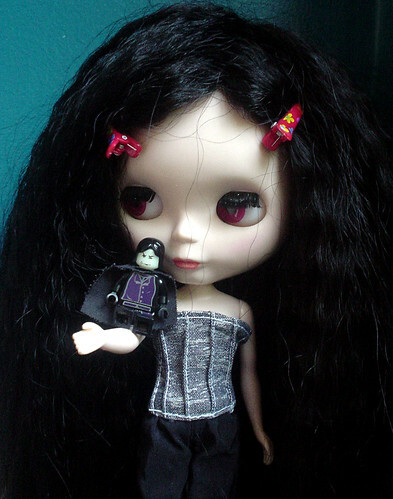 “Island Of Misfit Toys” Altered Doll Challenge winner has been announced! The winner of the challenge hosted by Noelle Hunt, is Heide Hibbard and her entry “Zuma”. You can see all the challenge entries on the EBSQ Forum. 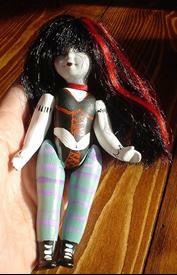 Just go to the “Doll Art” section and check out the “Island Of Misfit Toys” entries thread. You can get information on all currently running challenges in the “Challenge Central” section of the Forum. Congratulations Heide and thanks to everyone who participated in the challenge and Noelle for hosting it.